Ancient grains used to be rare and hard to find not because they contained some magical secret for a long and fulfilled life, but because they take a lot more work than modern wheats. Instead of the wheat berry popping free after a gentle rubbing, they need to be bashed and pounded. Now, of course, we have machines to do that kind of thing, but our ancestors were mostly only too happy to abandon hulled wheats, unless they had no option. Thanks for this fascinating series. I just heard the one on hulled wheats. One reason why they persisted may be their resilience under tough conditions. They germinate better in soaked soils (beside science, I learnt this from an alpine einkorn farmer in Turkey). Was not the Nile mud also soaked? They also persisted in Europe until well after the Middle Ages. 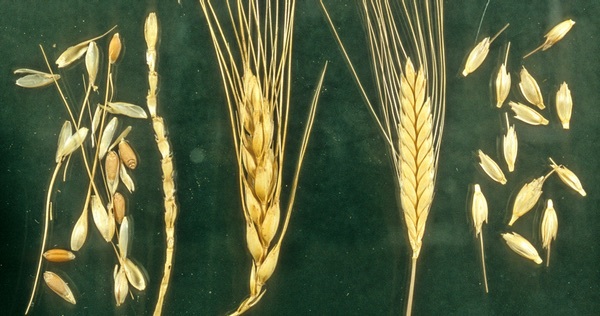 Spelt remained the staple in the Alps until after 1900, for its winter hardiness. From Gerard’s Herball (1596) emmer is called “starch Corne” and widely used for paper making. Thanks for the additional information. Is that in your wonderful book Our Daily Bread? Jeremy, I am really enjoying the series. Just a quick note, Episode 6 was not categorised as ‘obd’. Not sure if this was intentional, thought you might like to know. Thanks; I just noticed that while hunting down some kind of problem with the feed in iTunes and Pocketcast. Perfectly OK RSS and in Overcast. Maybe this error was the problem. @ztastylife I hope you enjoy it. @gabrielle_schaffner i can’t wait to check it out! You always have the best podcast recommendations. @ztastylife I think you’d really enjoy this podcast series Jeremy is in the midst of! I’m a bit behind in your podcast a day series, but I’m thoroughly enjoying it. :-) Looking forward to this. Wheat Initiative mentioned this article on twitter.com. Farro is not spelt. It isn't einkorn or emmer either. Farro "is an Italian ethnobotanical concept".